Economic catastrophe got you down? Sad that a luxury vacation to an exotic locale isn’t in your cards for at least five years, or possibly eternity? We know how you feel … but we also know how to have fun, wherever, whenever and however. This summer, TCD and VITAL Source are proud to launch our SUMMER TRAVEL SERIES, featuring regular old people taking exceedingly uncommon day trips, staycations and adventure escapes to unexpected destinations in Wisconsin and (only slightly) beyond. To kick start the series, Racine native and all-around foxy lady Erin Petersen took Senior Editor Amy Elliott and Cultural Zero DJ Hostettler on a whirlwind day trip to Racine, WI, for art, prom and kringle. Where are you headed this summer? Tell us about it! Shoot an email to info@urbanmilwaukeedial.com with your ridiculous travel tips, and stay tuned for the best vacations you’d never have thought of without us. — Ed. There are certain parts of “The Belle on the Lake” that I’ve always loved and have come to romanticize over the years as I become more nostalgic, but I wasn’t sure if the city we visited this weekend would look the same as I remembered it, or if the crew (and by crew, I mean Amy and DJ) would be impressed by my ability as tour guide. Amy: I was really impressed. Talks of small-city development and revitalization are frequently anemic, and while it’s obvious that Racine is developing at its own pace and on its own terms, business seems at least tentatively good, and the city is charming — breezy, pretty and nowhere near as dilapidated as the general ire directed toward Racine from Milwaukee had me expecting. Then again, after four years in Beloit, WI and most of a lifetime in Detroit, my standards for genuine blight are pretty high. Still, if the influx of summer residents and day-trippers from Chicago continues, and if the depressed economic climate turns around, Racine, it seems, could really be a gem – and in its own rusty way, it kind of is already. EP: Our first stop was the Racine Art Museum (441 Main St.), located downtown, where the fast-food restaurants and head shops I grew up with have closed or moved to new locations. In their place are quaint cafes, bookstores and quirky (but expensive!) shops. RAM opened in 2003, in a prime corner spot inside of a building once home to a bank and a department store. AE: The bank, actually, was the American Bank and Trust that John Dillinger robbed in 1933 – and to celebrate the opening of Public Enemies, RAM is showing some Warrington Colescott prints of Dilinger’s life and escapades. The show opens May 24! EP: The 46,000 square foot space was redesigned by Chicago-based architects Brinstool and Lynch, who transformed the building to include several galleries, an art library, giftshop, research center and sculpture courtyard. The entire building glows from natural light pouring through the massive windows, and as we stood in the foyer waiting for RAM director Bruce Pepich, I started to feel a bit overwhelmed. When I was in high school, I worked for the organization that today is known as RAM, when it was just the Wustum Museum. Wustum has been a part of the Racine community since the early 1940s after Jennie Wustum honored the wishes of her deceased husband and donated their house and property, along with a small trust fund, to the city of Racine for transforming the homestead into an art museum and public park. 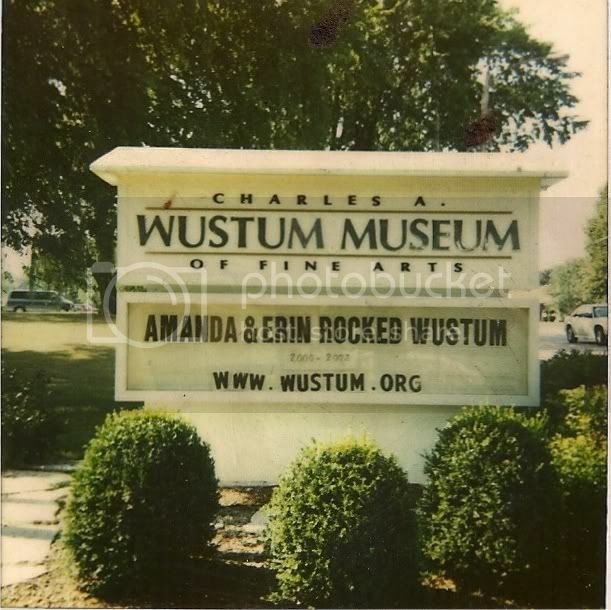 Thought it’s a small gallery housed in an old farmhouse, Wustum has hosted countless local, national and international artists and is recognized throughout the country for their commitment to fine craft and their extensive community education and outreach programs. I was a museum assistant; I helped with classes and gallery installations, and once I even sold a $10,000 Dale Chihuly vase. I loved that job. One of the last times I saw Bruce Pepich, Executive Director and Curator of Collections of the RAM and my former boss, he and his wife Lisa Englander were helping me move into my first apartment. I still had a mattress and some heavy items left at my parent’s house, but at the time we weren’t on the best of terms, so I had to sort of steal my stuff back. There was no way I could fit all of my things into my tiny Honda sedan, and my folks were only going to be gone for about an hour – multiple trips were out of the question. Bruce and Lisa brought the museum truck and helped me get every last possession out of my parents’ house in no time, giggling the whole way. They were the first adults to treat me like an adult, to trust that I was an intelligent and rational person. Coming up to the RAM, I was nervous to see some of the familiar faces. I wondered if they would remember me, or if they would still be pissed about the prank I pulled with my best friend on our last day at the museum. I was relieved to be greeted by hugs all around, and as it turns out, my Wustum prank still isn’t funny. Oops. Bruce is warm and welcoming and on top of his game all the time. As we walked through the galleries, he unleashed a torrent of information upon us — about the building, the architecture, RAM’s commitment to the community, their permanent collection — it was a whirlwind. AE: RAM’s permanent collection is massive, but they rotate what’s on display to dovetail with their featured exhibitions so that everything is part of the same conversation. Currently they’re showing figurative work that depicts the human form and is also functional. Specifically — get this — functional as a teapot. Every piece was as astonishing for its craftsmanship and beauty as for the message it communicated — these teapots really challenged and transcended what a teapot is, and what a teapot can do. EP: In one of the windows, facing the street, jellyfish cascaded down from the ceiling, the work of jeweler Arline Fisch. Looking closer, we saw that each creature was made from spun and hand-crocheted metal wire. The jellyfish wobbled in the breeze of a fan. On the first floor gallery, Bruce introduced to the intricate work of enamelist Jamie Bennett, whose naturalist, pattern-intensive jewelry was as exacting as an oil painting. Upstairs in the main gallery was the show Bigger, Better, More: The work of Viola Frey. During her career, Frey created massive ceramic sculptures, paintings and bricolage. Most of her work is inspired by ephemeral objects – knick-knacks and flea market curiosities – that she would often depict or mold into her creations. The exhibit is like a hall of giants; the larger-than-life sculptures measure as much as 12 feet tall, glazed with raw, brilliant colors. Bruce never skipped a beat. At each piece, he could tell us about the inspiration and themes in each artist’s work or about their personal lives and techniques, all the time tying each piece into the RAM’s dedication to community engagement, education and craft – the element craft, he believes, allowing a blue collar community to feel a keener connection to art. It was refreshing to see a cultural beacon that engages its entire community and works especially hard to educate future generations and open up young minds to a world of creative possibilities. AE: Of the unconventional beauty of a work of Viola Frey’s art, Bruce said, “I would hate to look at this with a hangover.” But some of us were hungover, and we’d driven down on empty stomachs and coffee. We had to eat. EP: All of my favorite diners are either closed down or just too skeezy to bring friends to, but then I remembered that new organic café that had just opened up in what used to be the old farmer’s market building. As it turns out, the cafe shares the large space with a Mexican restaurant and club that has a huge performance space in back (where DJ apparently sprained his ankle during an IfIHadAHiFi show years prior). At Blueberries (522 6th St.), we enjoyed a deliciously inexpensive brunch. All of the food on the menu is prepared to order, made with only no-fuss organic ingredients. Eggs are served soft, medium or hard boiled, and you’ll have to request butter on your toast, but all of the plates are nicely portioned and the food is amazing. AE: I enjoyed a soft boiled egg with vegetarian gravy and a whole wheat biscuit that hit the spot. Also — fun fact! — our table was lacquered with old LP covers. DJ’s toasted three-cheese sandwich looked good too, and per the menu’s suggestion he added tomatoes to ward off scurvy. EP: I had a Blueberry Cooler to drink — half iced tea, half fresh blueberry juice — and I’ll never drink anything else ever again. I would brush my teeth with that stuff if I could. Our trip to Racine continues with part two … in which we see meerkats, buy junk and go to prom! Keep reading!